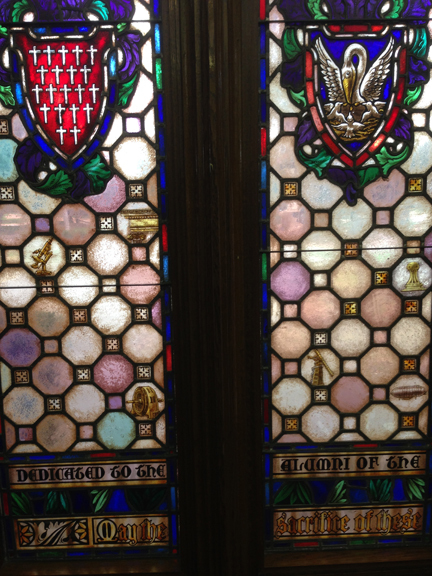 Judson studios, Stained Glass, Memorial Library, Los Angeles Public Library, California. 1930, Memorial Branch of the Los Angeles Public Library, Olympic Boulevard, Los Angeles, California. 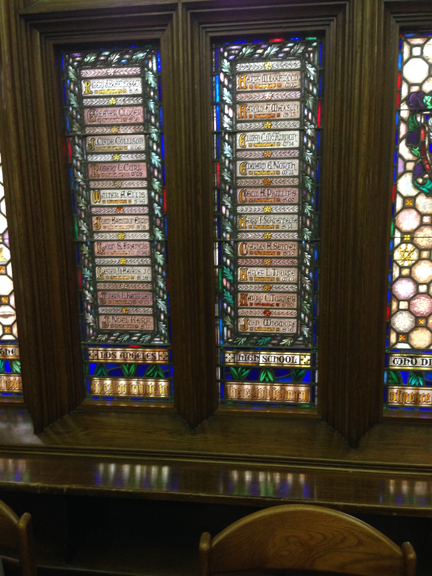 The middle pannel of the stained glass, made by Judson Studios, contains names of 20 students from the Los Angeles High School who died in World War I. Text at bottom of the panel reads: Dedicated to the Alumni of Los Angeles High School who died in the World War 1914-1918/May the sacrifice of these lives contribute to the establishment of Peace among the Nations. MEMORIAL WINDOW. Designed and built by the Judson Studios, Los Angeles. Gift of the Student Body of the Los Angeles High School, at a cost of $2,100. In the Heraldic style to harmonize with the architecture of the library, which is English Manor style of the Tudor period. Symbols and insignia are shown as decoration on the shields and are carried across the top row of windows representing the various divisions of the Army, Navy, Marines, Engineers, and Aviation. The second row of shields carry the national coat of arms: the arms of the State of California, the City of Los Angeles, and the Los Angeles High School; also the towers of the old and the new High School buildings. Beneat, is the school motto. In the lower row of lights (two center panels, i.e., vertically) are the meorial tablets giving the names of the alumni who died in the service. The shields in the side lights carry the emblem of "Sacrifice" pictures by the Legend of the Pelican and an heraldic arrangement of the poem "In Flanders Fields." Across the base of the window is the inscription "Dedicated to the Alumni of the Los Angeles High School who died in the World War. 1914-1918. May the sacrifice of these lives contribute to the establishment of peace among nations." In consideration of the educational purpose of the Library pictorial illustrations of the Arts and Sciences have been scattered throughout the window of the geometrical field.